My sermon from 9th Sunday after Pentecost (August 6, 2017) on Romans 9:1-5. Listen to the recording at the bottom of the page or read my manuscript below. Rev. Marc A. Stutzel at Christ Lutheran Church, Woodcliff Lake on Aug 6, 2017. Romans 9:1-5. Yesterday, for me at least, was a day devoted to birthdays. Now, I know that everyday is someone’s birthday. And thanks to Facebook, I wake up every morning knowing which of my friends are celebrating their big day. On some level, we’re never far from a birthday. But yesterday was different. As I sat in my room, composing this sermon, I was tired and completely stuffed because my family and I had just come back from a fun birthday party for a new friend. And the party was perfect for a five year old. There was a pool, bouncy houses, and more food than any person could possibly eat. As my stomach groaned and grumbled, angry at the amount of chicken wings I’d consumed, my sermon writing was distracted by the sound of my neighbors singing “Happy birthday” at a party they were hosting next door. Everywhere I turned, a birthday was there. In fact, even if I could have escaped to Mars yesterday, I wouldn’t have escaped from birthdays. And that’s because August 5 is also a birthday for the Curiosity Rover on Mars. 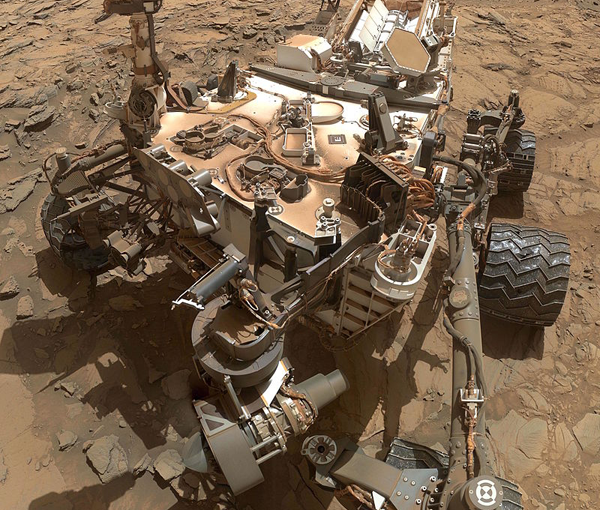 It’s there, on the dusty slopes of Mount Sharp, where that little robot had a birthday party…of one. There were no bouncy houses or pools for Curiosity to play in. And there was no endless pile of chicken wings for everyone to eat. Instead, Curiosity was… alone. The friends who celebrated its big day were here on earth. When it was time to sing “Happy Birthday,” the Curiosity Rover was a choir of one – and in 2013, it sung that song alone on Mars. Now, there’s something sad about the Rover spending its fifth birthday alone and millions of miles away from home. Even though the Rover is just a machine, our heart feels compassion and empathy for our robotic friend. It’s current situation might remind us of what our own lonely birthdays felt like and bring to mind those we know who have no one to wish them a happy birthday to. This kind of loneliness and isolation can be brutal. Being separated from what we know, who we love, and who loves us can leave us sad, depressed, and feeling incredibly broken. In some ways, one of the hallmarks of being human is learning how to deal with being alone. And that’s not something all of us are good at. Because we know that being around other people doesn’t always mean we are not alone. If no one knows our name, knows our hopes and dreams, and stops by to actually see us, loneliness stays with us instead. And this loneliness can show up in a multitude of ways. We can move to a new city and not know a soul. A broken relationship can take our friends away from us. Or a new path or life style or way of being can leave us feeling alone if no one else seems to join us. We lament and cry out as these feeling of isolation break into us. We can even wonder out loud if maybe this new reality, this new life, this new way of being should be undone. Our thoughts and prayers can sound a little like Paul’s does here. With sorrow and anguish, we too might want to be cut off from this new reality, because the isolation is just too much. Which might be why Paul says something in our reading from Romans’ today which doesn’t sound like Paul at all. For a brief moment, while dwelling in his sorrow and anguish, Paul wonders if he might want to be cut off from Christ. Now, even the thought of Paul writing this is a little bananas because this is Paul we’re talking about. This is a guy who traveled around the Mediterranean, preached in city markets, and invited Gentiles to know how God’s kingdom includes even them. This is a guy who had no problem going to Jerusalem to confront Peter when Peter stopped eating meals with those who were non-Jews. Paul is one of the few workhorses of the early church that we know and celebrate. He’s the last person we can think of who should even hint at something like he does in verse 3. But Paul says this surprisingly thing and I wonder if he does because loneliness is that strong. We know, from scripture, that Paul had many companions on his travels. We know he wasn’t the only Jewish believer who, in the generation after Jesus’ death and resurrection, traveled throughout the Mediterranean Sea. And we know pockets of Jesus’ followers were all over the Roman Empire. When we take a step back and look at the wider context, we can see how Paul wasn’t really alone. But Paul probably felt alone because his isolation was very real. Not every Jewish person experienced Christ like he did. And most Gentiles could never accept a savior who died, crucified on a cross. And even in the communities that agreed with Paul, Paul kept finding Gentiles who were trying to earn God’s love through the good works they thought God demanded. Paul dealt with people all the time but that didn’t mean he never felt alone. Yet being alone and feeling alone are two separate things. Paul, immediately after his words in verse 3, spends the next two verses on all the ways he’s not alone. As a Jew, Paul knows his lineage and his connection to God’s story. Paul never in his writings renounces the love and the special relationship God has with the chosen people. God picked them while they were slaves in Egypt to be God’s people. God chose this band of people with no rights, no legal status, and no power, to be God’s beloved. It wasn’t the Egyptians, with their chariots and gold and military might, who God chose in this special way. God picked these strangers, living as foreigners in the land of Egypt, as the people who will change the world. The covenants, the law, the prophets, and even Jesus himself, were given to this former nation of slaves who, in Paul’s day, were still occupied by an empire not their own. And God did this, according to Paul, because God made a promise to Abraham and to Jacob and to the people of Israel. And God is, first and foremost, a God who keeps promises. Which is why the Messiah, this Jesus, isn’t for the select few. Jesus is Jewish but God’s promises are for all. Abraham wasn’t only an ancestor to the people of Israel. He also was the father to many nations – nations and peoples and races and ethnicities that now populated and crossed borders with the Roman Empire. This Jesus, as the culmination of Abraham’s promise, makes a difference to everyone because he is Emmanuel, God-with-us. Even in our loneliness, Jesus is there. Even when we feel like no one knows who we are, he does. In fact, we don’t hold these feelings of loneliness by ourselves. Jesus holds those emotions with us because there is nothing God won’t go with us through. Jesus isn’t only a part of the Trinity. Jesus is also a promise that, no matter who we are or what we’re experiencing, we are known….and we are loved. Rooted in Paul’s experience of Jesus is an acknowledgement that Jesus really is for us, that Jesus is really with us, and that God’s blessings are not reserved for only a select few. Paul knows that God’s kingdom is expansive and has space for Jews and Gentiles and everything in between. God’s love isn’t reserved for the select few; God’s love is for all. And as part of God’s people, our love and care for others is to be as expansive as God’s, regardless of their race or class or background or where they were born or where they go. Because, in Jesus and in the Cross, the walls between us and God were torn down – so that the walls we build between ourselves, these walls that make us lonely and afraid and full of sorrow and fear – can be torn down too.